Gate6 has an interesting and somewhat strange history. To begin with, there is the fact that both Jan and Tony spent a substantial part of the musical lives quite successfully playing, as it turns out now, the wrong instrument :-). Jan played guitars for Challenge and Isolation and is an excellent guitar player. Tony played keyboards for 10 years, recording 3 albums with Marathon, a Dutch Prog band from the 90's. Secondly, in spite of the fact that they had been close friends for over 25 years, they never managed to start their own band or even play in the same band. In 2005, when they finally did manage to sit together and became creative, things turned out to work quite well. Tony dug out his old Les Paul and Jan went on a buying spree and collected even more synths including a big fat Korg WaveStation and an even bigger and fatter Roland Fantom. Initially the idea was to do a project together but after writing some 15 songs in Tony’s studio, the idea is forming to turn it in to a real band. Tony's ex-Marathon buddies Willem van der Horst (Drums) and Jacques Suurmond (Bass) are asked to join and voila, the beginnings of Gate6 are there. The band starts to rehearse and are occasionally asked to turn down the 'Wall of Sound' a little. Arguments like 'You aren't the only band trying to practice around here. Can you turn the volume down a little bit?' They solve this by playing louder and pretending not to hear the question. As a detail, before 'Gate6' became 'Gate6' they went through a whole list of names of which 'Black Light Machine' was the most notable. Reactions to this name varied from 'Black what?' to 'Black Light what?" so they changed it. Pity. Anyway, finding a good singer turns out to be a problem as always. Jan and Tony ask a number of candidates but some refuse, others did audition but turned out to be unable to actually sing or be strong proponents of Dutch folk music :-(. A good friend of Jan en Tony, Erik de Boer (whose name you'll find under the Special Thanks on God Machines for other reasons), recommends former Symmetry band mate Erik Masselink. Erik has a very distinct voice with lots of power and feel and, after listening to 'Voices’, the third track on Symmetry's 2004 release 'A Soul's Roadmap', they are sold. As a real metal head, Erik has some doubts at first but quickly starts to warm to the more melodic Gate6 version of Prog. 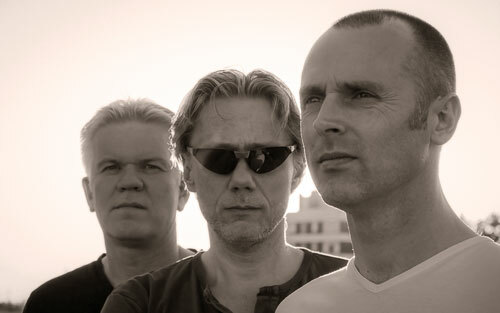 When Willem van der Horst decides to leave Gate6 in 2007, he is replaced by Martin Kuipers, a former Symmetry member and a current member of pretty much every band in the region including but not limited to Mystrez, The Barstool Philosophers, INRI, etc. After working in this setup for a while, it becomes clear that things start to go somewhere. The material produced by Jan and Tony is evolving, benefitting tremendously from Martin’s and Erik’s input. This results in the production of their first Album ‘God Machines’. ‘God Machines’ deals with the digitization of our society. Will a movie like Blade Runner become reality?